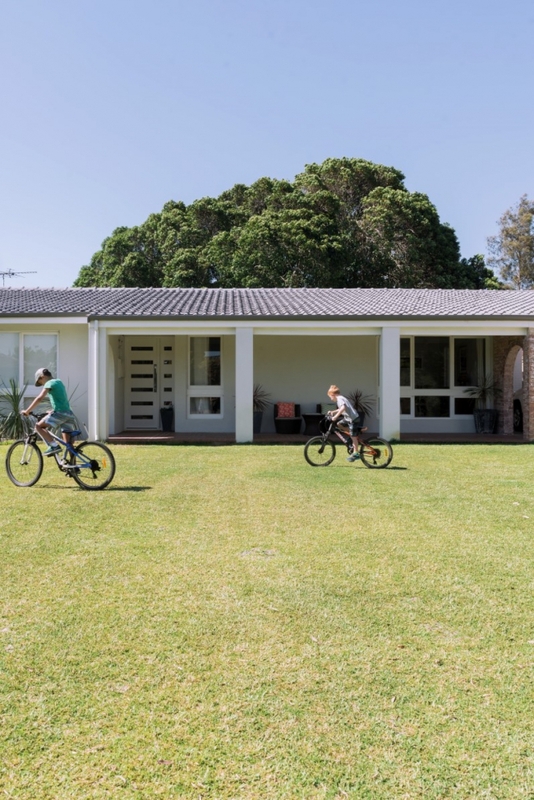 When Penny and Mat bought a dark, dated and daggy 1970s home in City Beach, they thought it might be a knockdown job – and their friends presumed they would bulldoze it and build anew, too. 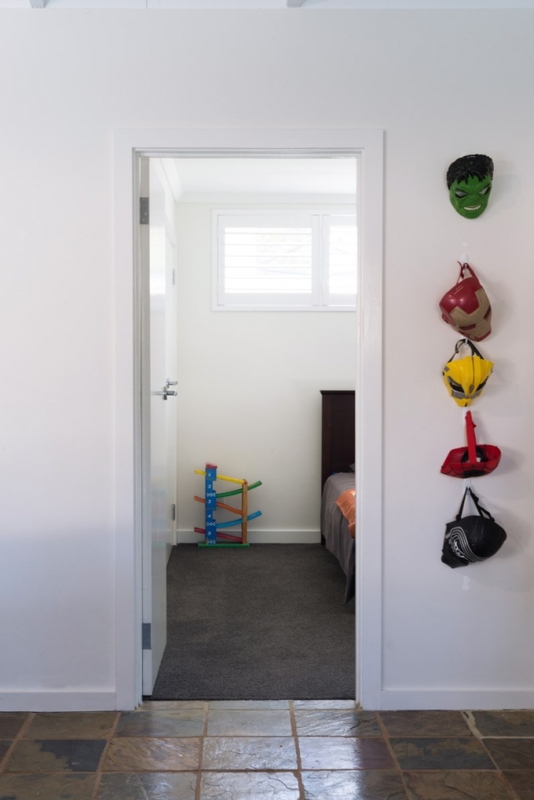 But when Penny and Mat decided that instead they were going to renovate and extend to make it a home for them and their four kids under 12 – while living in the house during renovations - a lot of their friends told them straight-out they thought they were crazy. No-one could call Penny and Mat nuts now (I don’t think!) 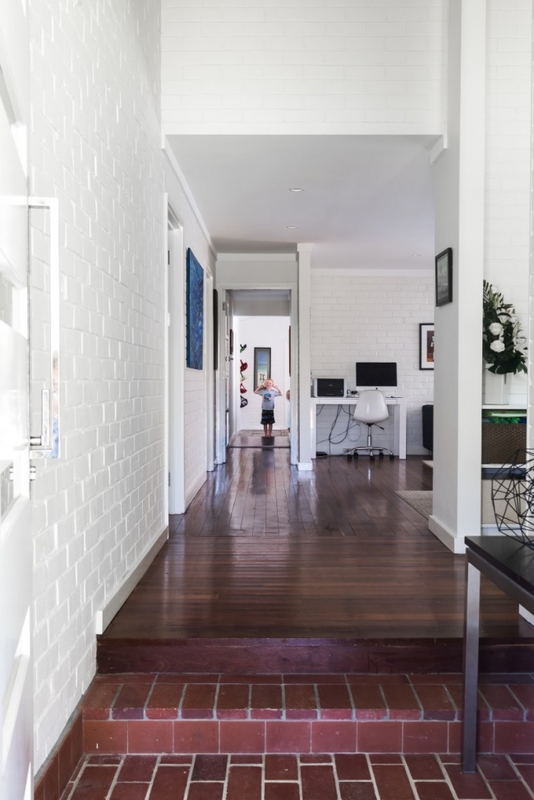 With the help of local builder Exactus Homes, Penny and Mat have turned a house once destined for demolition into a wonderful, warm family home that combines a light, contemporary refresh with its original character and charm. 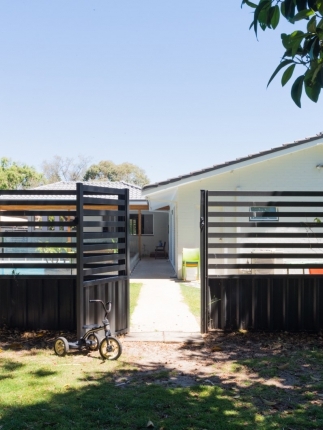 Some simple changes completely changed the look of the home's streetscape. Photos by Meghan Plowman. 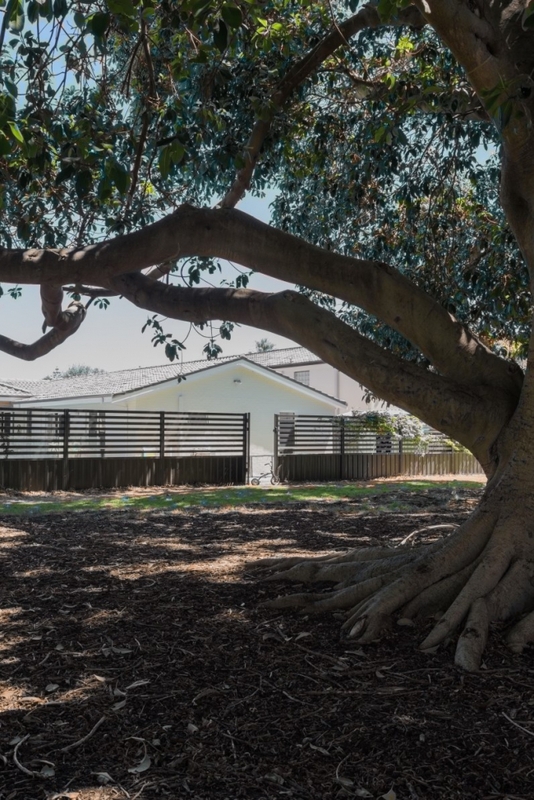 SITE CHALLENGE: The park behind the house is beautiful, but Ralph says it meant there was limited access to the rear of the of the block, where all the extensions and renovations were done. 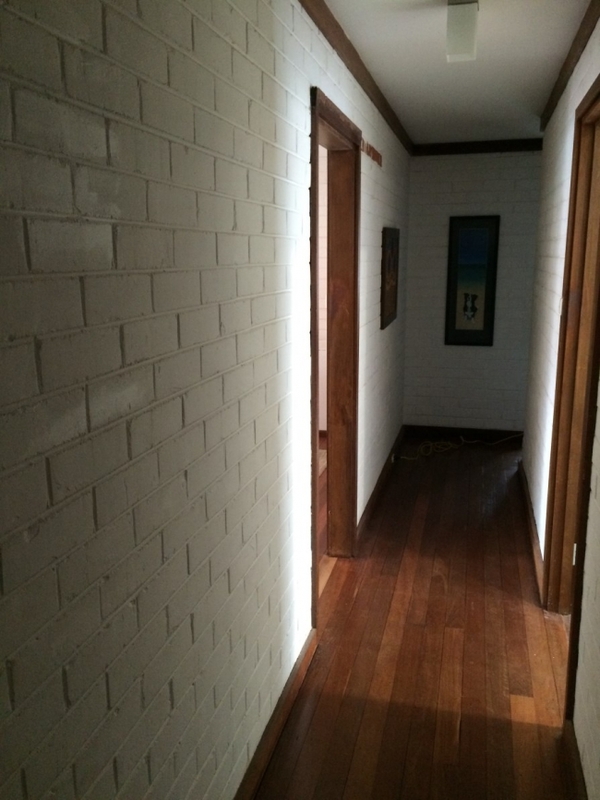 “Our tradespeople had to cart all materials manually to the rear of the block,” he says. “Penny struck up great friendships with the Exactus trades, sharing a mutual passion for hockey with our carpenter, whose wife played for Australia in the Rio Olympics!” (Penny and Mat both played hockey at high levels). Photos by Meghan Plowman. Chatting to Penny in the kitchen while the kids run rampant in the yard! Beautiful blooms by Sonia Jean Reed. Photos by Meghan Plowman. MARBLE, SMAUG AND DUCKWELL: Visits back to the 40,000 family farm in the wheatbelt are frequent. 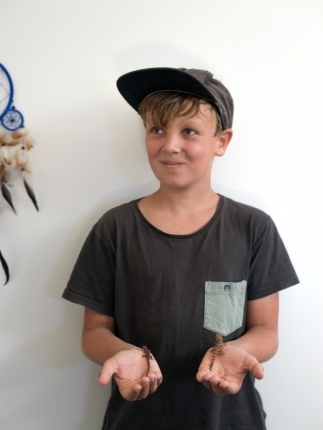 Here Tom found his two very cute Bynoes geckos, Marble and Smaug, who live in a tank in his room, along with Duckwell the yabby. Photos by Meghan Plowman. 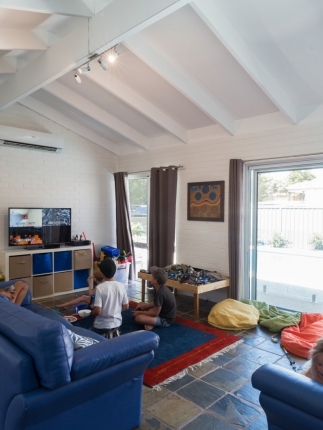 ESCAPING THE HEAT: The slate floors in the games room help the room stay cool. When Meghan and I visit for our photoshoot, it’s a 41 degree day and the kids are mostly inside that afternoon. But when it’s not too hot, they are almost always found in the garden, playing in the pool or at the park. 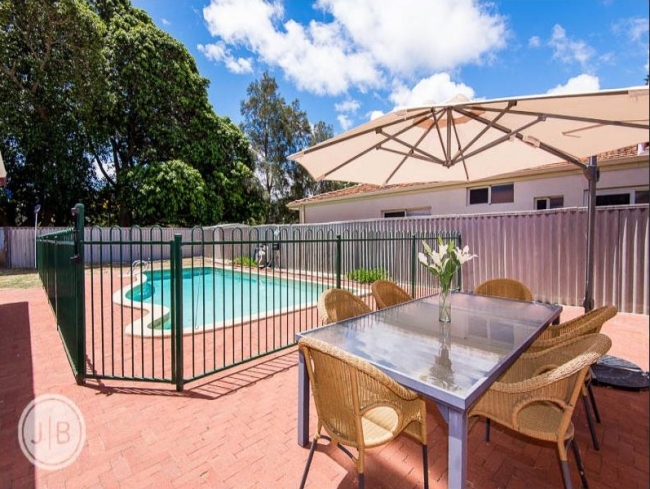 The family entertain often, with barbecues, drinks, kids’ birthday parties and friends staying overnight. Photos by Meghan Plowman. 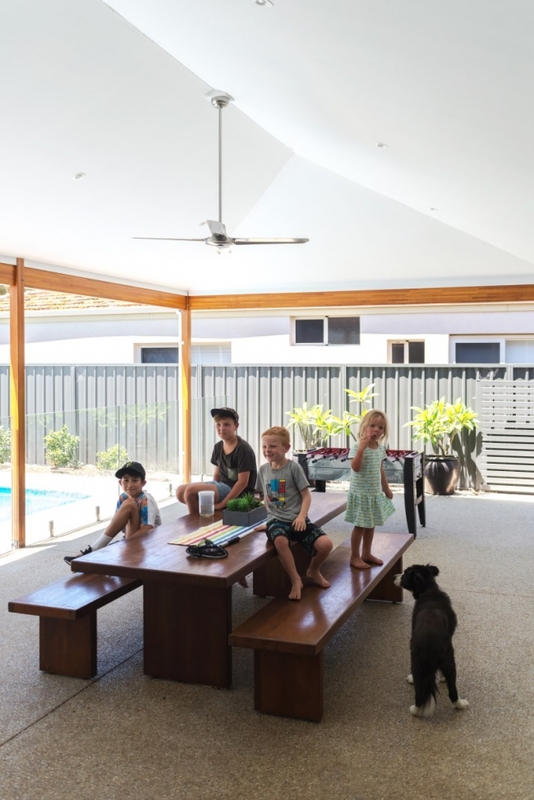 Backing onto a massive park and with a pool in the back garden, it’s now a perfect family home for the couple, their four children, Tom, 11, Sam, 9, Ben, 7, and Kate, 3, and two border collies. 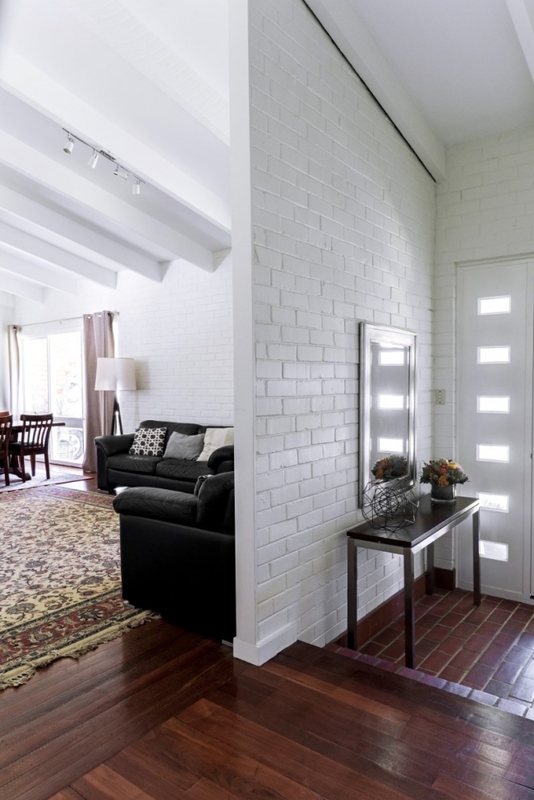 Just like the family who live there, there is something about this house that is laidback, unpretentious and inviting. It was a hard house to leave! Mat and Penny met in Darwin through their mutual love of hockey (both are high-level hockey players; Mat has played on a national level). When they began their family, they knew that they wanted the same kind of outdoorsy, free-roaming, adventurous childhoods they each had. 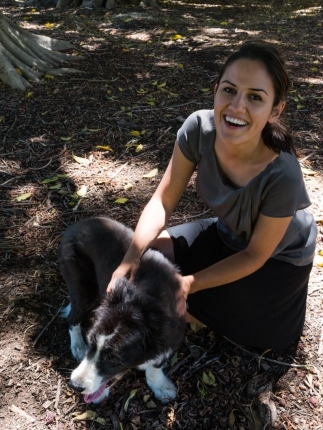 Penny grew up on a homestead in the wheatbelt on a massive 40,000 acre farm. I’m such a city kid that my mind boggles when Penny tells me it takes 45 minutes to drive from end of her family’s farm to the other. 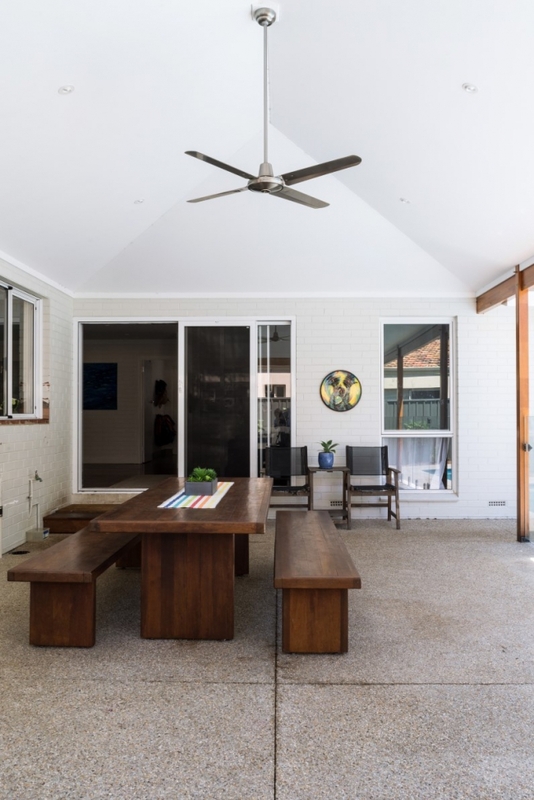 Mat grew up in a Queenslander-style home in Darwin. 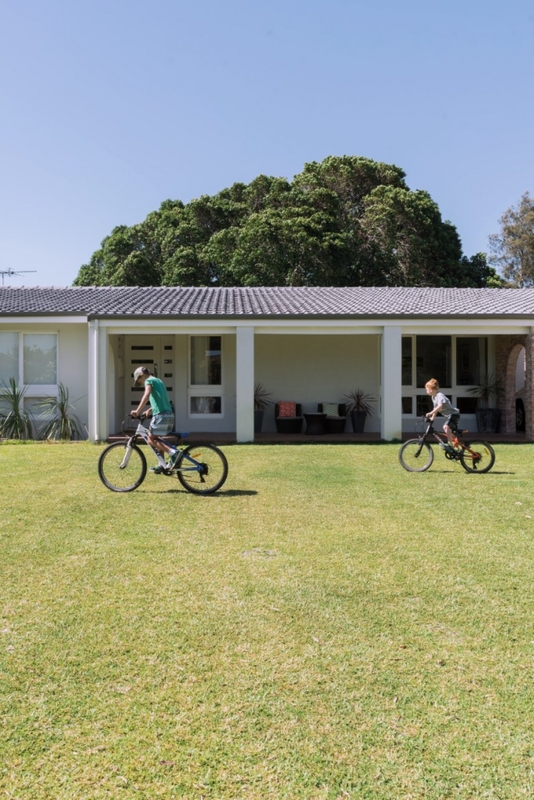 OUTDOORSY LIFESTYLE: The house, garden and the park beyond perfectly accommodates this busy family of six. “We love to swim, sit out the back, go to the park, and the kids love the trampoline and having friends over,” says Penny. We all play a lot of sport which is why the park is great.” Photos by Meghan Plowman. Penny and Mat bought the home for the park directly behind it. Oh, that park! 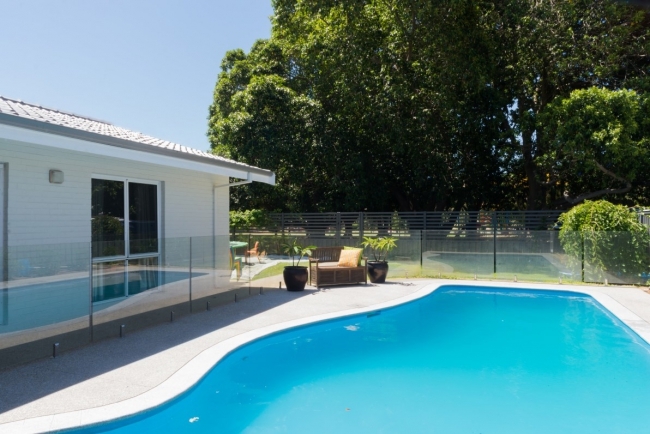 The house backs onto endless lawns with huge mature trees, a playground and playing courts. It is a beautiful spot. 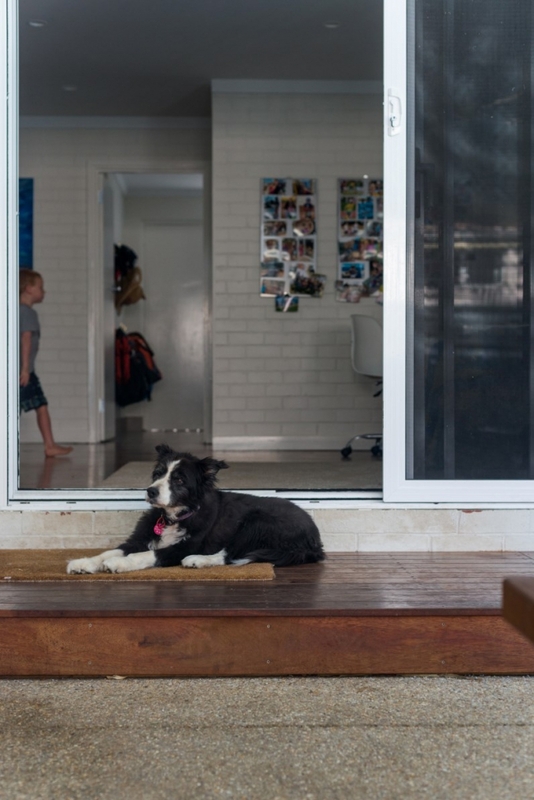 “We loved the park the house opens onto,” says Penny. “We wanted to buy anything that backed onto the park. This was the only place that came up in our price range. I think it was going to be knocked over, then the previous owners had a change of plan and sold it instead. But the house itself was nowhere near as lovely as the park. However it was solid. “The house was built in the early 70s and was a very basic, cottage-style single level house with three bedrooms and 1.5 bathrooms originally,” remembers Penny. 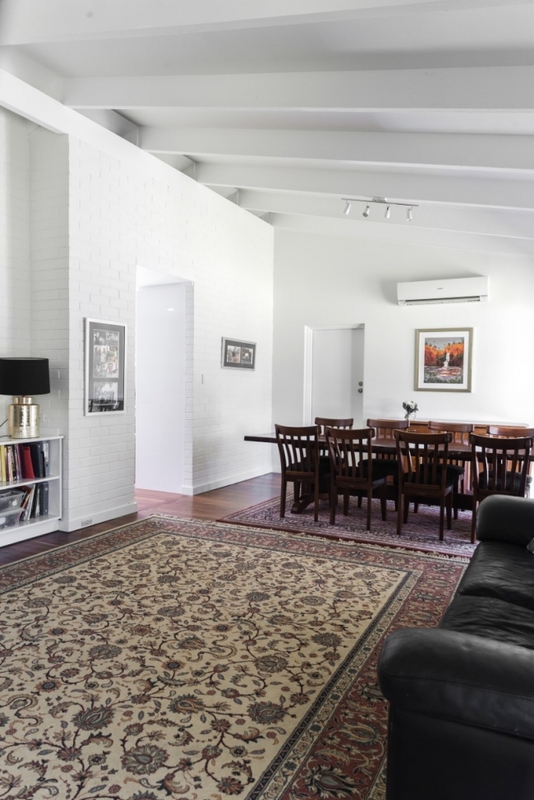 “It had a separate dining and living, a galley kitchen, lots of archways, jarrah floorboards, raked ceilings, face brick inside and out and a large front yard." 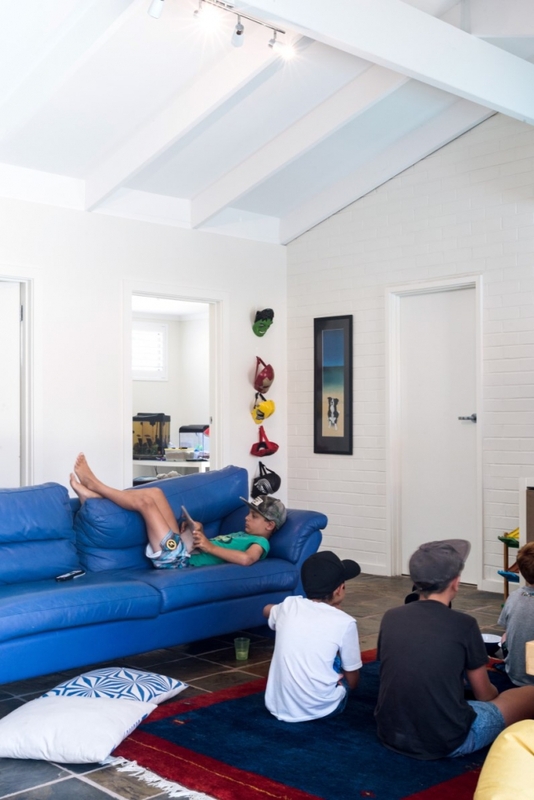 THE FAMILY ROOM: The family love to gather and relax here together over a movie. The house has a lovely comfortable feel to it. It’s not pretentious at all and Ralph agrees. 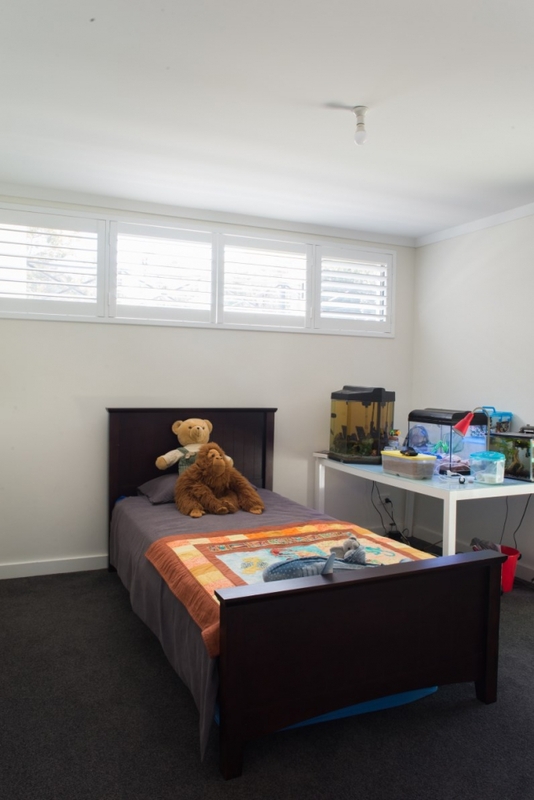 “It’s a very homely home – with four kids under 12 it’s full of toys and activity! It’s a more spacious home which gives them room to play. As country people, Matt and Penny like a rustic style. They have a lovely timber table that shows the marks of the family’s use.”Photos by Meghan Plowman. THE NEW ALFRESCO: The garden has been transformed. 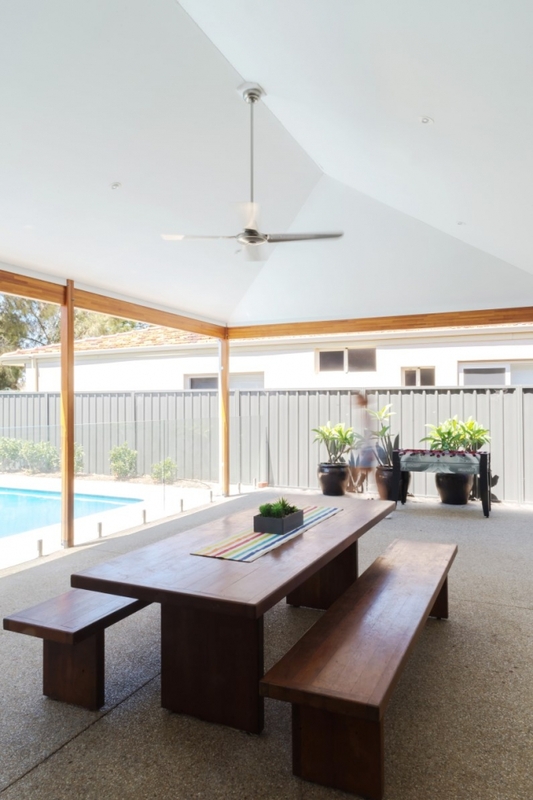 “Part of the extension was a new alfresco,” says Ralph. 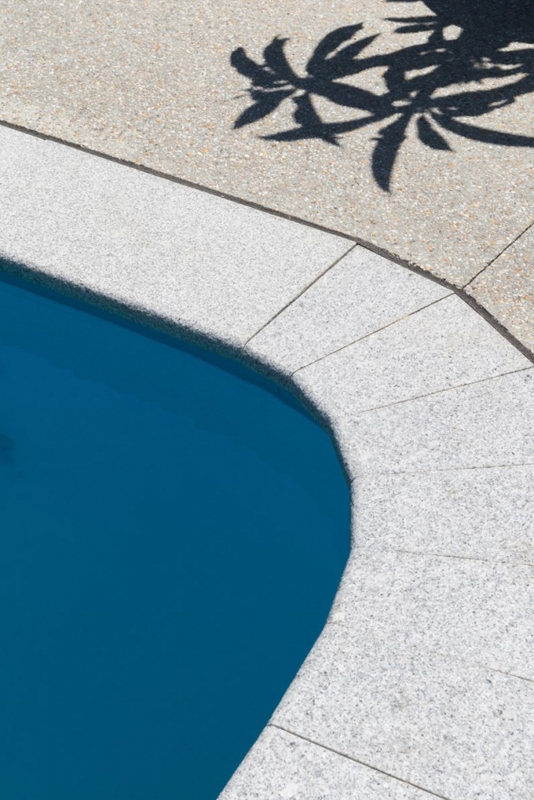 “There was nothing there to begin with – just horrible red pavers that filled the whole area from the home to the pool. Around the pool was an old-fashioned pool fence. 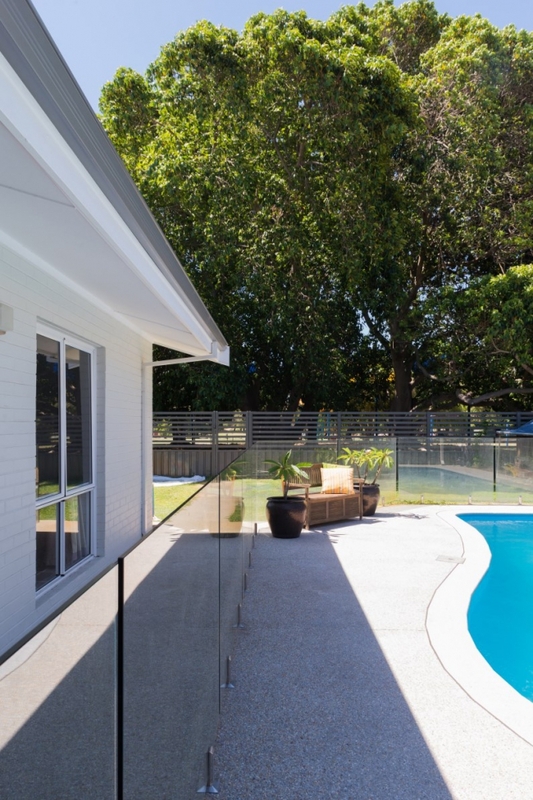 We built a beautiful new alfresco area, added stone aggregate and glass pool fencing.” Photos by Meghan Plowman. 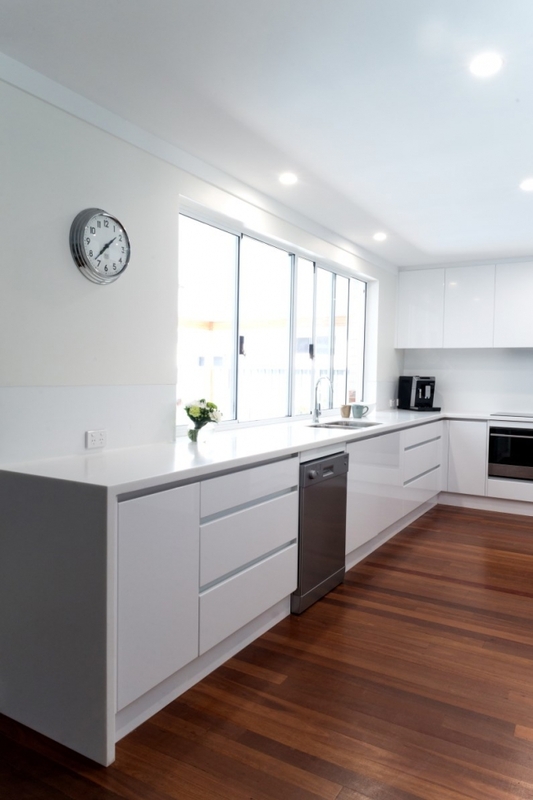 AFTER: With lots of storage and benchtop space and a clean, unfussy, contemporary look, the renovated kitchen is perfect for this busy family of six. The kitchen has a clear outlook from the big window out to the pool and yard, so adults can always keep an eye on kids playing in the pool. 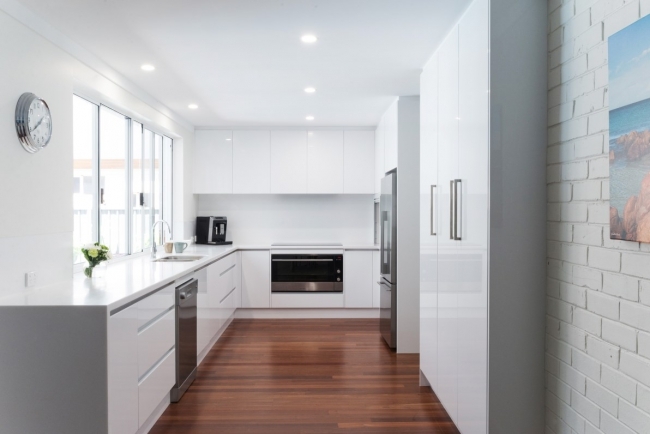 “The kitchen looks out over the patio and the windows can be opened so things can be passed in and out easily and the person in the kitchen can still join in the conversation (or yell out at the kids! )” says Penny. 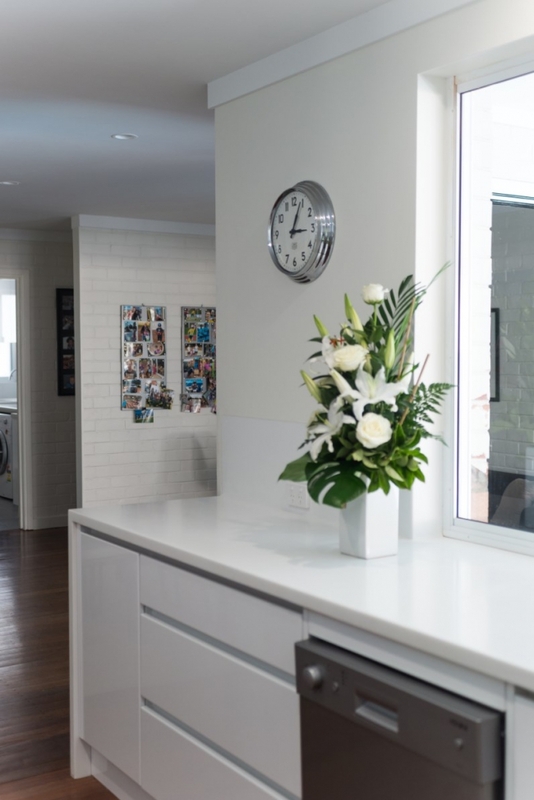 “Joyce Kitchens did the fitout of the kitchen and they were very good.” Photos by Meghan Plowman. In the 80s the house received an addition; a games room at the rear with a bathroom, exposed beams and nice slate-tiled floors. 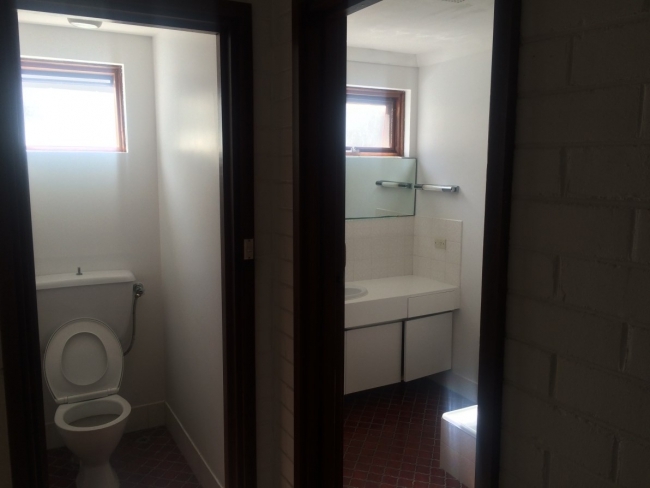 It had some character, but when I see the before pictures, I’m not surprised that they initially thought the house might be a demolition job. “It was very, very basic,” says Penny of the house. “No garden, no patio, an old pool, no lawn. The interior was very dated, with original carpets. The bathrooms were old and the laundry consisted of a rusted-out sink. The kitchen was old, but it worked. Basically it was a shell of a house! We just figured we could live in it until we decided what we would do with it - which was more than likely knock it over. “We spent a bit of money putting in lawn and fixing up bits and pieces, just to make it more comfortable. By the time we moved in and started living in the house we grew to love it. Penny and Mat knew husband-and-wife team Ralph and Sandra Brewer of Exactus Homes through their children’s school and had seen their work. They knew immediately they would ask them to do the renovation. BEFORE: Internally several walls and 70s arches were removed to open up the main part of the house (this is the way the home used to look when one walked in). “The house has a better flow now,” says Ralph. 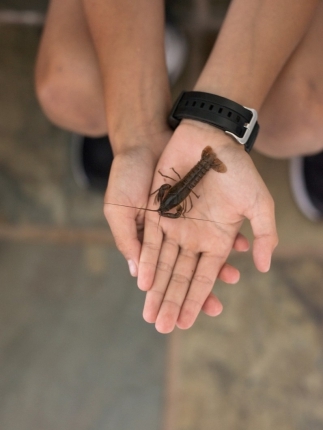 “There’s no wandering around hallways, you can walk straight in rather than walking around a maze to get to the living areas.” Photos by Meghan Plowman. Yes, this family of six lived in this head-to-toe renovation the whole time! I am impressed. 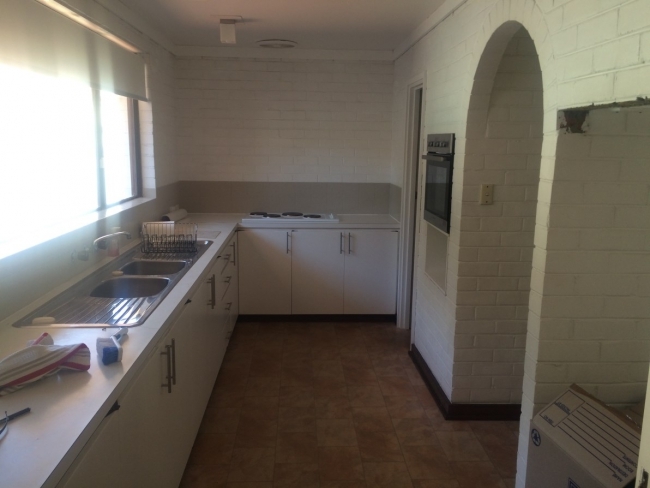 I barely cope with a kitchen renovation - how did they not lose their minds? 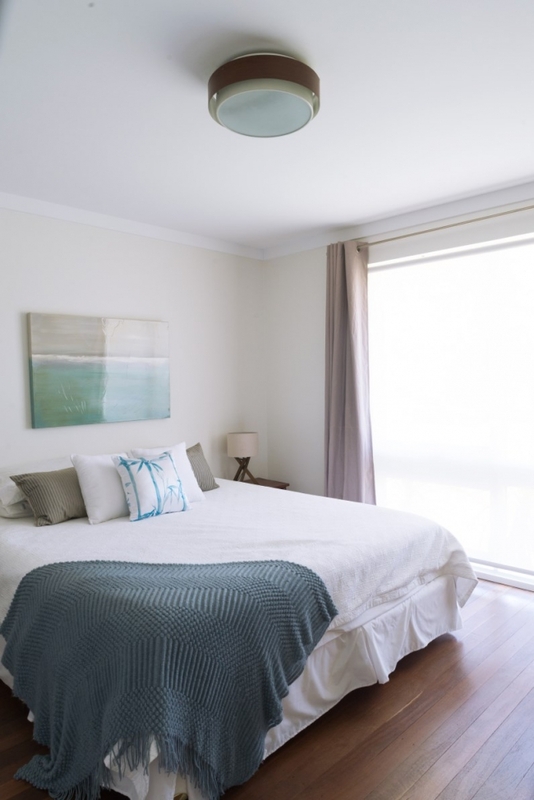 To start with, Penny says it was decided to do the work in stages, starting with the laundry and the bathroom before adding the fourth and fifth bedrooms, and to try to keep the renovation fairly simple. enny says the process took just under a year and went really well. “We had great builders, excellent communication,” she says. When I start to ask Penny about her and Mat’s decorating tastes, she makes me laugh because she is so frank and funny about her and Mat being quite indifferent when it comes to interior design. “We are not house-y people at all!” Penny laughs. 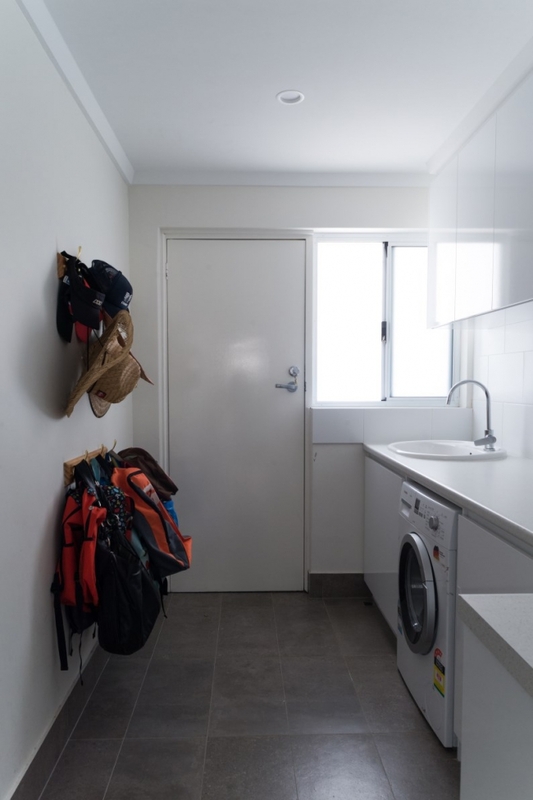 “When it comes to things like choosing tiles, I just want to go to a bathroom shop, have someone show me two tiles and say, ‘Pick one!’” We just wanted a functional and comfortable home for us and our children and pets. 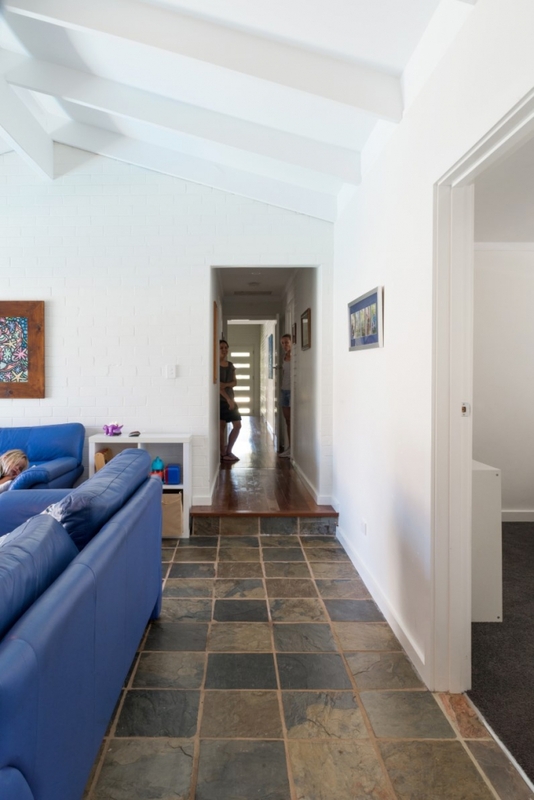 We wanted something the family could grow into, something bright, light, easy to clean - a house we weren’t precious about so the kids could use all the space and we wouldn’t be stressed over damaging things. 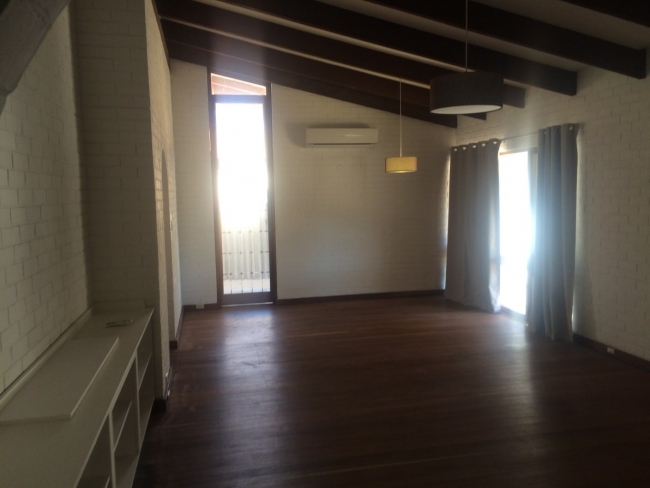 Our interior is very simple, we shopped at Freedom, IKEA, Spotlight and Gumtree! 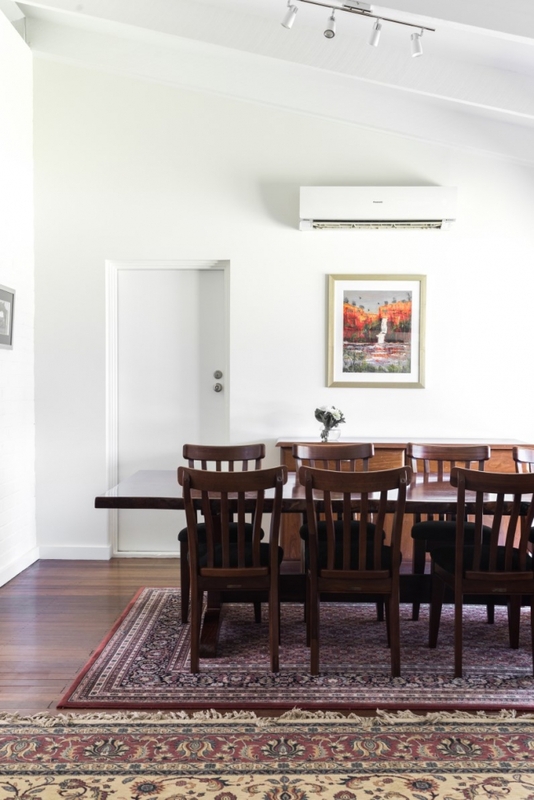 THAT DINING TABLE: “We love our jarrah table because we bought it as a single slab just after we got married and my husband and friends made it into a table,” says Penny. (I love it too!) 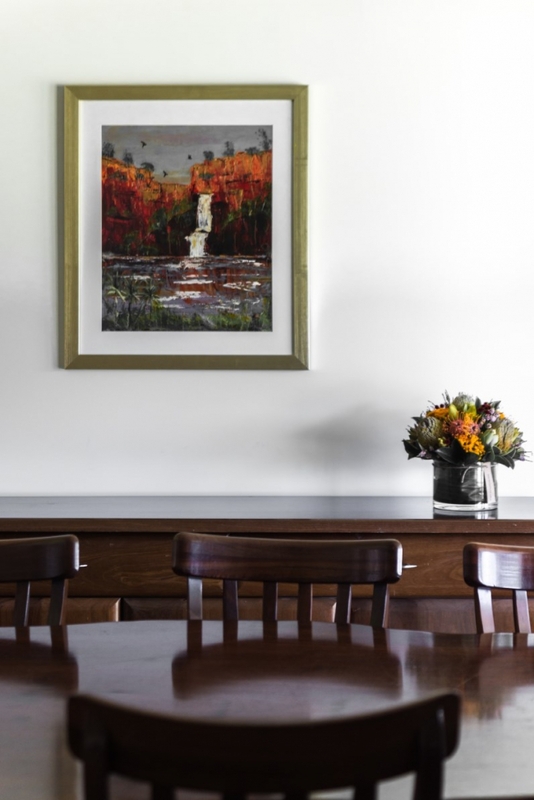 “We also love our painting of Litchfield Park in the NT, and our canvas of Castle Rock - two of our favourite spots - and our photo wall in the lounge.” Photos by Meghan Plowman. Florals by Sonia Jean Reed. Photos by Meghan Plowman. 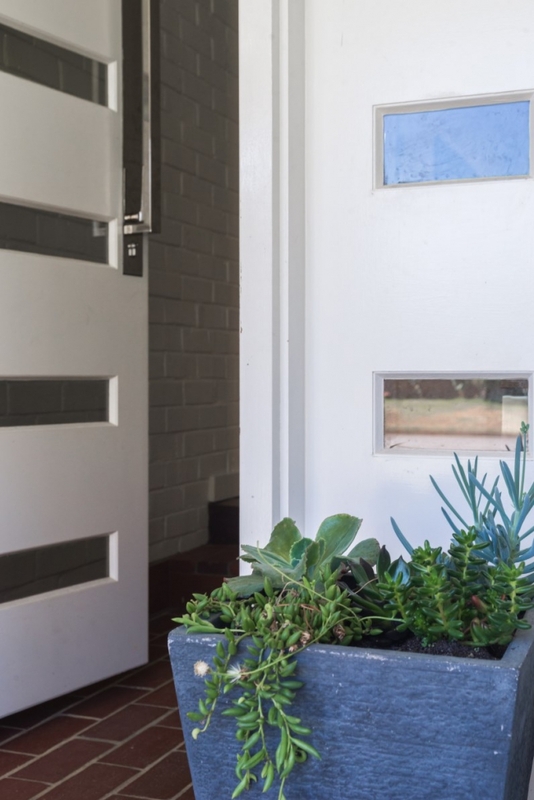 ENTRYWAY GOALS: I love how Exactus Homes opened up the entry. I walked in from the heat (it was a whopping 40 degrees on my visit) and immediately felt myself relax once I stepped into the cool, light entryway. This house has a really nice feeling to it. Photos by Meghan Plowman. THE GAMES ROOM: The games room was originally used as the main bedroom. It has lovely slate floors and high raking ceilings with exposed beams. I know slate floors seem to divide people into love and hate camps! I actually really like slate floors – yes they can make a dark room seem darker, but they can look great when a room gets nice natural light. Because a few more tiles were needed with the work that was being done, Sandra and Ralph from Exactus managed to source tiles from a house that was getting bulldozed. Photos by Meghan Plowman. 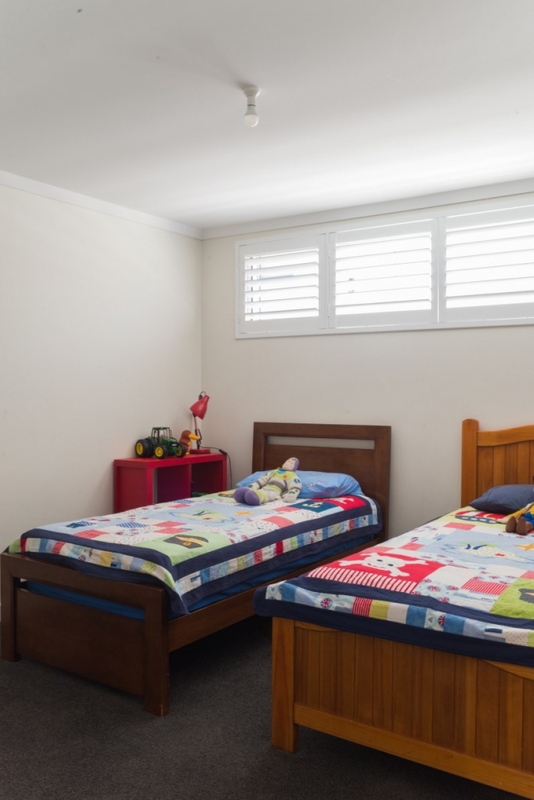 THE NEW BEDROOMS: Ralph and the Exactus Homes team added an extension to the rear of the hose, adding two bedrooms for the kids beside the existing playroom/games room. 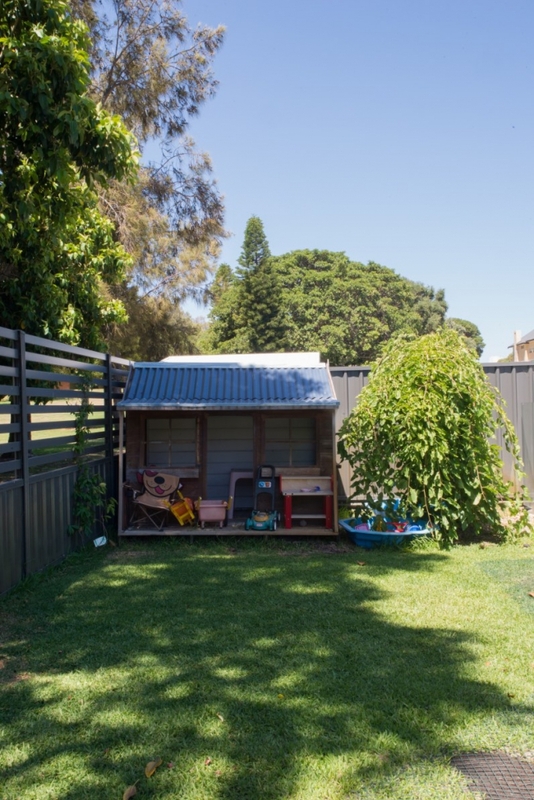 “There was plenty of room there between the home and the back boundary – it was just a dead space of lawn, pavers and a clothes line,” says Ralph. The new kids rooms are lovely. Photos by Meghan Plowman. 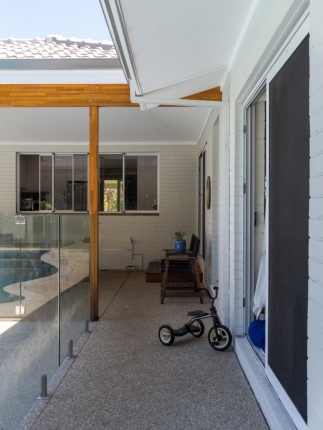 ABOVE: The kids' games room opens directly onto the garden. The slate floors keep it cool on a hot 40 degree day! Managing to score a house in their dream location has paid off – Penny says the entire family is so happy with their dream parkside location. 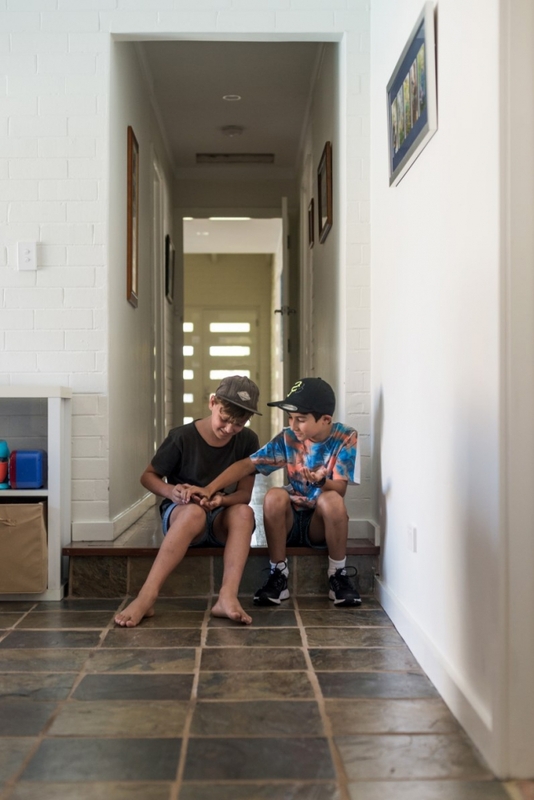 “It’s a quick walk down the park to the beach, close to school, a quiet street, easy to walk to Empire Village shops for coffee, dinner and shopping,” she says. “We love the park, the space, the friendly neighbourhood, the dog walking crew in the park, the neighbours, and the kids live close to friends and family! 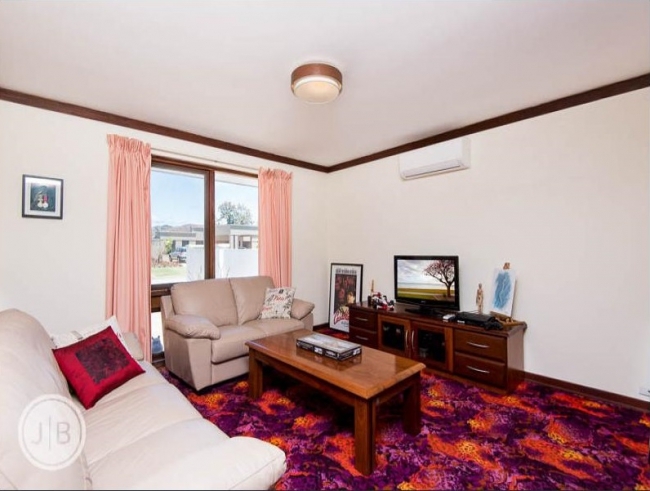 Wanting to renovate your own 1960s, 70s or 80s home? I ask Ralph if he could share his top tips. 2. Decide what you want to achieve. 3. The best place to start is to talk about what’s possible. It might have once been deemed a demolition project, but right now, Penny says there is nothing they would change about their lovely house. “As the kids get older, we might try to upgrade a few features, but right now we are enjoying living in what we have,” she says. “It’s easy and fun and very stress-free - we have no desire to build a new house. New stuff causes unnecessary stress for us! 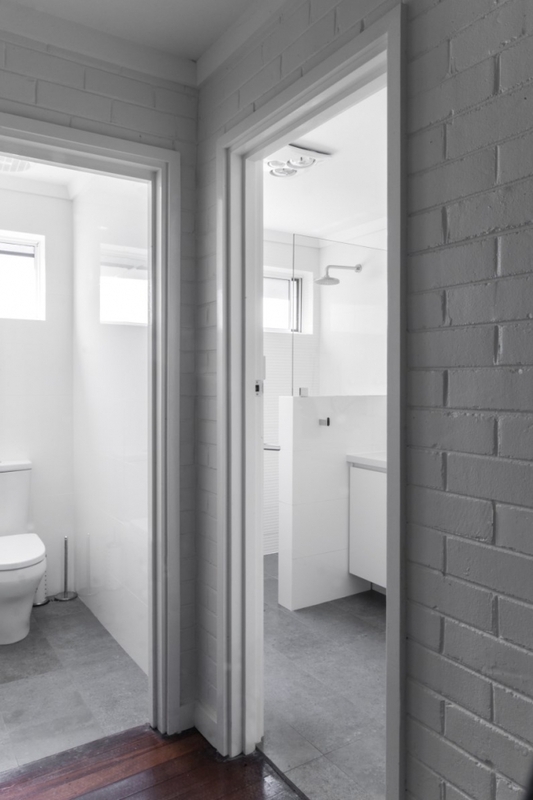 You can see more of Exactus Homes’ renovation and extension projects on their website here, or follow them on Facebook, Pinterest or YouTube. Do you love interior design, real homes, renovations and before and after stories? I love chatting with other house nerds and finding out what they want to read abou on here. You can follow me on Instagram @housenerd, Facebook, Twitter, Pinterest or Bloglovin. Love this one Maya. I really like that you do so many blogs on "real homes". 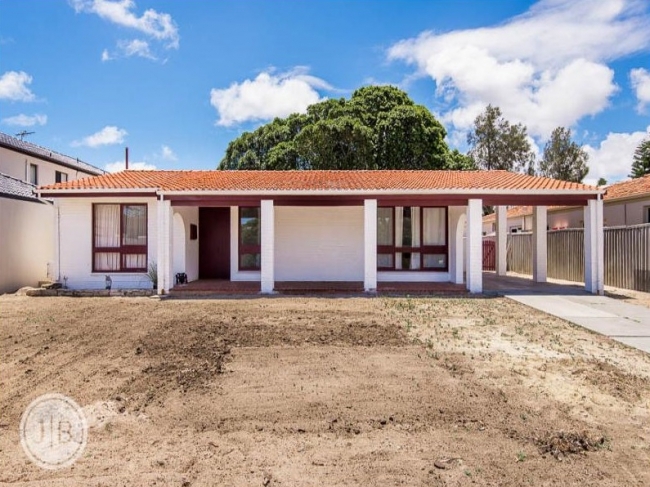 Sure the show homes are nice to look at -- but the real homes are the ones that make me feel inspired as we slowly work through our own 1960s "needs some TLC" home! This home tour has every thing -- warmth, character, family, garden, it is just what a childhood home should be. Ahh thank you Renae, that is really nice. I think I know what you mean. I still pick up magazines and I love looking at the beautiful homes in them... but having written stories for homes mags I know how much stuff often goes on 'behind the scenes' to produce the photos. 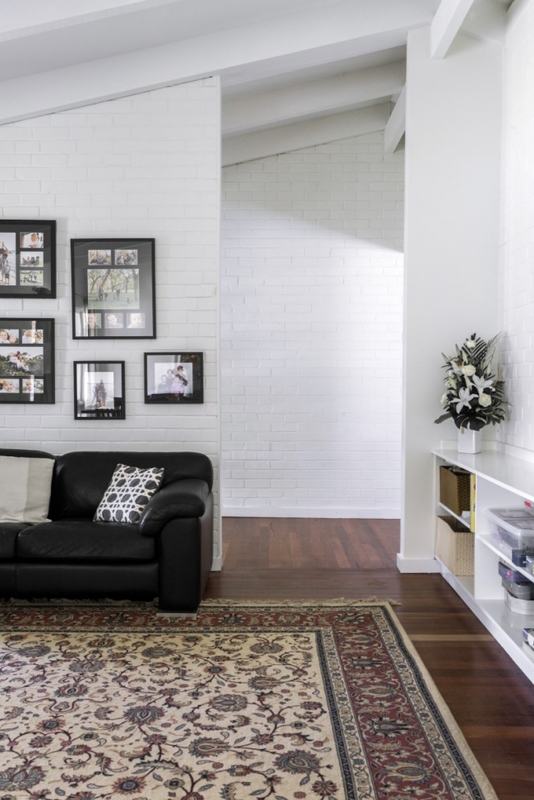 Not all mags do this, but often the houses really don't look or function the way you think they would by looking at the photos - so much is plain not real or contrived. And there is this funny part of me that is oddly disappointed when I find that out! 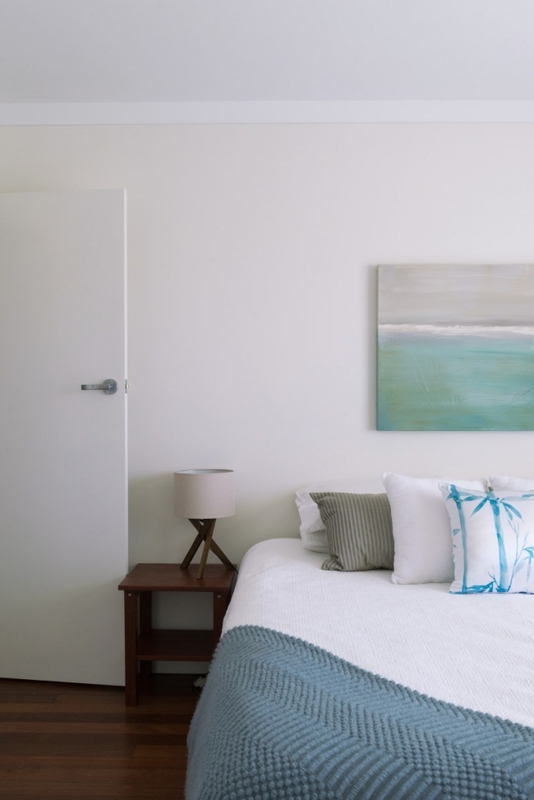 Real homes and real renovation stories make me feel much more inspired and when I started this blog I thought I want to show homes as they really are. Perfect childhood home!! Lucky kids. Their friends must be so envious. I am envious! Me too! I completely agree. Love this one Maya. I extremely like that you do as such numerous online journals on "genuine homes". 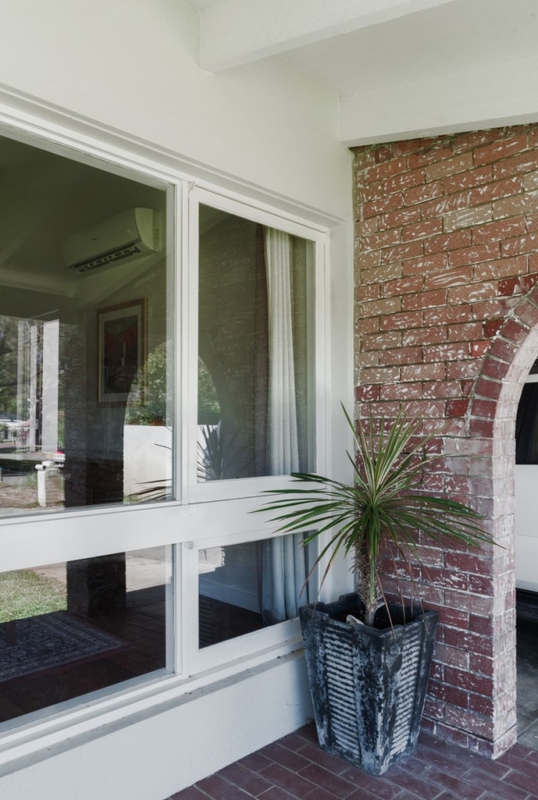 Beyond any doubt the show homes are pleasant to take a gander at - however the genuine homes are the ones that influence me to feel propelled as we gradually work through our own particular 1960s "needs some TLC" home! This home visit has everything - warmth, character, family, plant, it is exactly what a youth home ought to be.